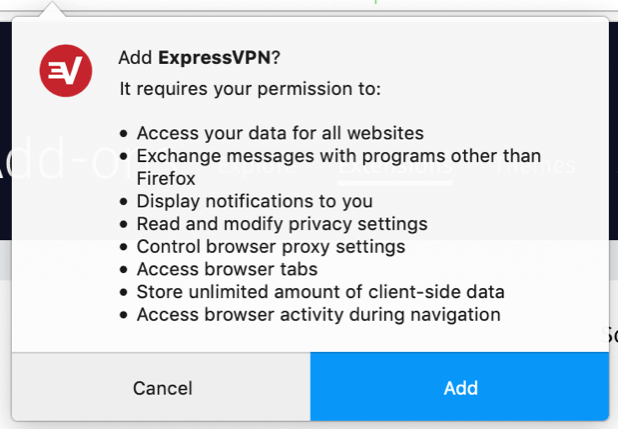 The ExpressVPN browser extension requires a number of permissions to operate. Below are the detailed permissions we request and what they are used for. nativeMessaging Used to securely communicate with the ExpressVPN desktop app. Privacy Used to prevent WebRTC leaks. all_urls Used to spoof location requests, to block malware and phishing, and to implement HTTPS Everywhere. webRequest Used to block sites known for malware and phishing and to implement HTTPS Everywhere. webRequestBlocking Used to block sites known for malware and phishing and to implement HTTPS Everywhere. tabs Used to block sites known for malware and phishing. notifications Used to show you notifications regarding VPN connection status changes. alarms Used to download a list of malware and phishing sites to be blocked every 24 hours. storage Used to store internal data needed by the extension to operate. unlimitedStorage Used to increase the amount of storage the extension can use. We store configuration settings, app status information, and lists of malware and phishing sites to be blocked. This storage can only be accessed by the extension itself. No website or other extension can see it. webNavigation Not currently used—reserved for potential future functionality (content blocking). contextMenus Not currently used—reserved for potential future functionality (whitelisting websites to exempt them from privacy and security features). cookies Not currently used—reserved for potential future functionality (cookie management). proxy Not currently used—reserved for potential future functionality (proxy connections). Occasionally, we may need to request additional permissions, and Chrome will ask you to re-enable the extension. These requests are genuine and safe to approve. Click the exclamation mark icon (!) 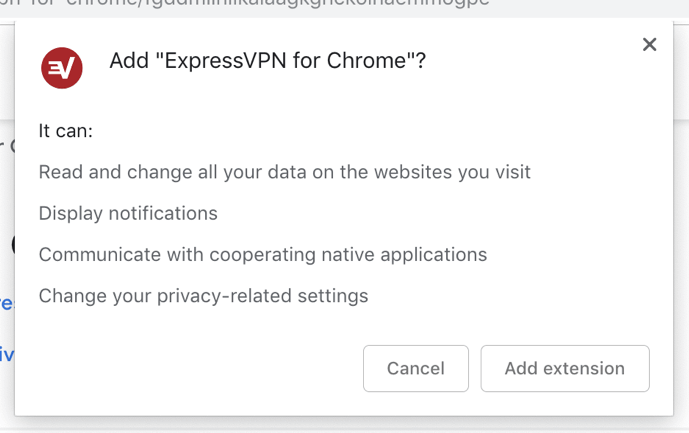 in the Chrome toolbar and select ExpressVPN for Chrome requires new permissions.